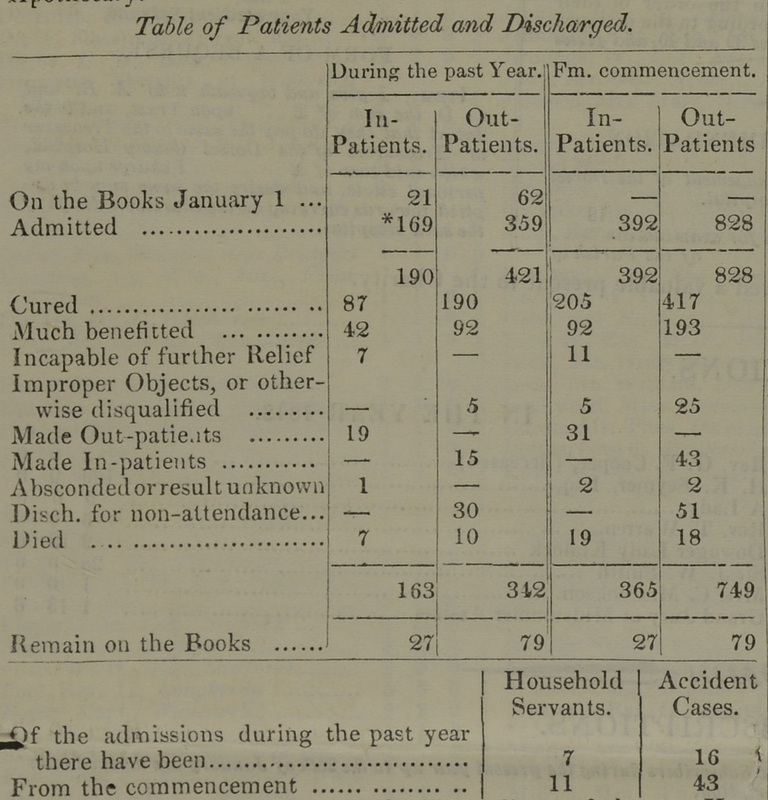 The following is an extract from the hospital’s annual report for 1843 (published in 1844) which is at the Dorset History Centre (reference D-WLC/Z/61). The report included a list of subscribers and the ‘Treasurers Abstract’ (a transcript of which can be found among the published balance sheets). The Committee of Management of the Dorset County Hospital have again to report satisfactorily of the progress of the Institution, and to express their thankfulness for the blessings which, by the Divine Providence, have attended its charitable provision for the relief of the sufferings and ailments of the sick poor. The following is the Abstract furnished by the House Surgeon and Apothecary. *211 In-Patients’ Tickets used, there having been 42 renewals. The State of the Funds, and the Expenditure of the past Year are shewn in the Treasurer’s Abstract appended to this Report. The only change in the Officers of the Hospital has been caused by the resignation of the late House Surgeon and Apothecary, Mr. GOOD, whose zeal and attention during the whole of his residence in the Hospital were of the greatest value to the Institution in its early years. This took place in May last, when Mr. EMSON, the present House Surgeon, was elected at a special General Meeting, to fill the vacant Office. The Committee have to acknowledge the very efficient discharge of their duties by all Officers of the Institution. They take the liberty of mentioning the unremitting attention of the resident Officers, and that of the Chaplain, as having been attended with great benefit and comfort to the Patients. And it gives them pleasure to mention also the uniformly good conduct of the Domestic Servants. The Committee have to return their best thanks to Clergy who have made Parochial Collections on behalf of the Hospital. From this source £129. 10s. 5d. has been derived, exceeding the similar Collections of last year by the sum of £29. 8s. 8d., inclusive of £12. 12s. 10d. specially collected for the Building Fund. This source of income, they trust will annually increase. Attention to the latter part of the Report will shew how very important it is that such should be the case. The Committee have to acknowledge the great increase of attention (except in a few instances,) to the Hospital Rules. They trust this will continue, as it is necessary both to the right discharge of their duties, and still more to the convenience of suffering applicants. The chief omissions this year have been of Guarantees for In-Patients. These ought to be given by the Parish Officers, and for the convenience and satisfaction of Subscribers some alteration is proposed to be made in the papers of recommendation. The Committee have to call the attention of Subscriber to some special circumstances of the management of the past year. Subsequently to the last General Meeting the Committee, pressed by the great increase of applications which were continually rejected for want of room, determined to enlarge the No. of patients admitted, and trust to the liberality of the County to increase their support accordingly. In this they have not been mistaken. On the 30th of March last they increased the number from 20 to 30, reserving of this number 3 beds for accidents and cases of emergency, and they are happy to say that after funding all the Donations, they have only exceeded by £5 the Income arising from Subscriptions and Casualties, and have still a balance in hand amount to £35. It is true that the prices of Provisions have been low, and the increased number of Patients have not been in the House for all the year. On the other hand the cost of Medicine has been materially increased. The Subscription List has increased during the year from £560. 4s. 6d. to £630. 7s. 0d. a most gratifying circumstance; while the Receipts from Casualties, not including large Donations, have increased from £114. 4s. 7d. to £143. 2s. 1d. both circumstances shewing progressing interest in the Institution, and its position in public estimation. It is such a progress also, as the Committee feel warranted in relying on for the future. At the same time they earnestly hope that the friends of the institution, and especially the Parochial Clergy, whose Parishes and Poor are so essentially benefitted, will not abate their efforts on its behalf. To induce this, it should enough to mention one fact, that while not so many as 2 out of 3 existing powers of recommendation have been used during the last year, the whole amount of Subscriptions, does not equal more than 2-3ds of the cost of those recommendations that have been used, so that if the Committee were called on to give effect to all the Claims of Donors and Subscribers, the cost would be more than double the amount subscribed. So that large and encouraging as the Subscription list is, without those casual aids which are providentially afforded during the year, the Hospital could not continue its benefits at their present extent. The Committee are however prepared to do so, relying on those aids continuing as they now are on the increase. The Committee have further to state their opinion that it is most important for the sake of the patients, even without increasing their number, to continue the building of the Hospital, and that whatever sum remains of that which was originally subscribed for the purpose of the building ought now to be given up for that object. This sum is about £1500. A further sum of £700 is already subscribed in pursuant of an appeal made since the last Special General Meeting. The Committee have gone over most carefully the Plans relating to the remainder of the building both Wards and Establishment, with the Medical Officers of the Hospital and their Architect, Mr. FERREY. Such alteration have been proposed and shewn in a rough plan prepared by Mr. FERREY as are consistent with their increased experience of the necessities of the Institution. The cost of carrying out these Plans is estimated to be inclusive of Contingencies, about £3,500 – by which means 24 additional Beds, divided into 5 Wards, and complete accommodation for the whole Establishment will be provided, so that the old Buildings will be entirely unnecessary. But there is good reason to believe that Tenders for the Building may be considerably under that sum. And the Committee, relying with confidence on the character which, by the Divine Blessing, this Institution has already attained, look to an early extension of its comforts and advantages, as commending itself to the charitable feelings and friendly assistance both of those who have, and those who have not hitherto supported it. ARTHUR H. DYKE ACLAND, Chairman. P.S. – In acknowledging the Collections kindly made by the Clergy for the Institution the Committee will be pardoned for expressing a hope that the annual Parochial Collections of this Year will not generally, or at least wholly, be made over to the Building Fund, for if such should be the case that amount will be lost to the Maintenance Fund of the Hospital, and the Income of the Year will most probably fall short of its expenditure, or beds must be closed. THIRD ANNIVERSARY MEETING HELD AT DORCHESTER, 13TH JANUARY, 1844. The above report was adopted and ordered to be printed and circulated. The Twelve Elected Members of the Committee were appointed for the ensuing year. The subject of continuing the Hospital buildings was taken into consideration, and on the motion of Lord STAVORDALE it was agreed that instead of £1000, the sum of £1500 should be taken from the funded property of the Hospital and applied to the Enlargement of the Hospital, and that an appeal should be made to the County for the remaining sum required of £1300. The Thanks of the Governors were noted to the Committee – the Medical Officers of the Institution for their special kindness and attention – to the House Surgeon, Matron, and to the Chaplain for their unremitting assiduity in their several duties – to the clergy who had made Parochial Collections – and to the Treasurer and Auditors. The Audits were for the future ordered to be Half-yearly instead of Quarterly. The Cordial thanks of the Meeting were given to the Right Honourable the Chairman.